Now you can this treasure on a beautiful recording to make studying and reviewing easy. Available as download or CD. Complete text below. Baltimore Catechism No. 2: Confirmation Catechism Questions and Answers. Track by track printable script - CD or Download. 13 pages reprintable from audio CD or Download. CDs come in a flexible white DVD case. Catholic audio book for adult converts. See our matching Catholic worksheets, too. 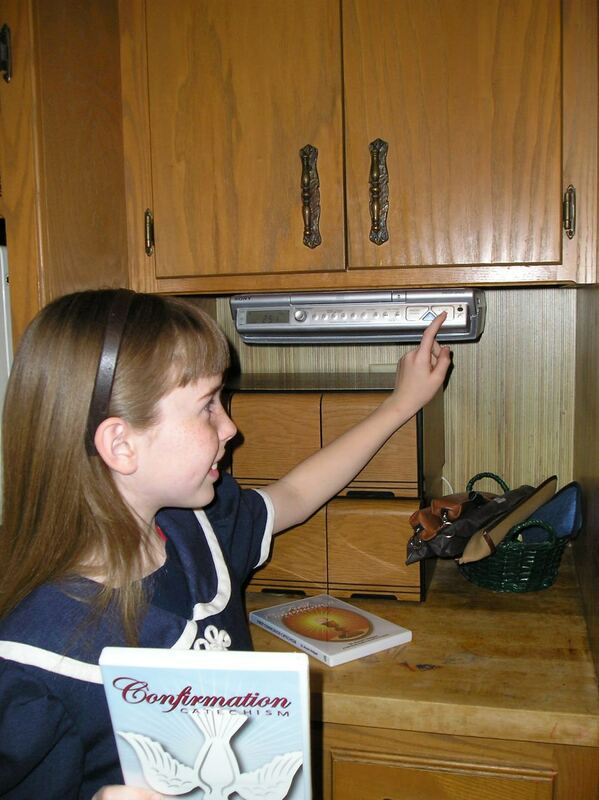 Saint Anne's Helper Audio Catholic Confirmation Catechism has the Baltimore Catechism No. 2 Confirmation Questions and Answers. Children benefit by the review and adults can learn from the audio book format. Track by track on the CD or Download, it is easy to find the questions, answers, and prayers that you want to learn or review. The Audio comes with an enhanced format that also includes a printable text verbatim to the audio file. The audio (CD or Download) has a text file that can be printed so that you have the verbatim text word for word for reading or for quizzes. See the actual Confirmation catechism questions below. Share or save to buy later. Which Catholic Confirmation catechism questions will be on the quiz? Usually the ones listed below. The main Baltimore Catechism quiz questions and answers (1880s and 1950s) as well as the Catholic prayers and some devotional prayers for Confirmation are included in the Saint Anne's Helper audio Confirmation catechism. Like having a tutor! I believe in God, the Father Almighty, Creator of Heaven and earth; and in Jesus Christ, His only Son, our Lord; Who was conceived by the Holy Ghost, born of the Virgin Mary, suffered under Pontius Pilate, was crucified, died, and was buried. He descended into Hell; the third day He arose again from the dead; He ascended into Heaven, sitteth at the right hand of God, the Father Almighty, from thence He shall come to judge the living and the dead. I believe in the Holy Ghost, the Holy Catholic Church, the communion of saints, the forgiveness of sins, the resurrection of the body, and life everlasting. Amen. Our Father, Who art in Heaven, hallowed be Thy Name, Thy Kingdom come; Thy will be done on earth as it is in Heaven. Give us this day our daily bread; and forgive us our trespasses as we forgive those who trespass against us; and lead us not into temptation, but deliver us from evil. Amen. Hail Mary, full of grace! The Lord is with thee; blessed art thou amongst women and blessed is the fruit of thy womb, Jesus. Holy Mary, Mother of God, pray for us sinners, now and at the hour of our death. Amen. I confess to Almighty God, to blessed Mary, ever Virgin, to blessed Michael the Archangel, to blessed John the Baptist, to the holy Apostles Peter and Paul, and to all the saints, that I have sinned exceedingly in thought, word and deed, through my fault, through my fault, through my most grievous fault. Therefore I beseech blessed Mary, ever Virgin, blessed Michael the Archangel, blessed John the Baptist, the holy Apostles Peter and Paul, and all the saints, to pray to the Lord our God for me. O my God, I firmly believe that Thou art one God in three Divine Persons: Father, Son and Holy Ghost. I believe that Thy Divine Son became man and died for our sins, and that He will come to judge the living and the dead. I believe these and all the truths which the Holy Catholic Church teaches, because Thou hast revealed them who canst neither deceive nor be deceived. O my God, relying on Thine infinite goodness and promises, I hope to obtain the pardon of my sins, the help of Thy grace and life everlasting, through the merits of Jesus Christ, my Lord and Redeemer. O my God, I love Thee above all things with my whole heart and soul, because Thou art all good and worthy of all my love. I love my neighbor as myself for the love of Thee. I forgive all who have injured me and ask pardon of all whom I have injured. O my God, I am heartily sorry for having offended Thee, and I detest all my sins, because I dread the loss of Heaven and the pains of Hell, but most of all because I have offended Thee, my God, Who art all good and deserving of all my love. I firmly resolve, with the help of Thy grace to confess my sins, to do penance, and to amend my life. Amen. 7. What are the Ten Commandments of God? I am the Lord, Thy God; thou shalt not have strange gods before me. 8. What are the precepts of the Catholic Church? To confess my sins at least once a year. All Saints Day, November 1. 10. What are the seven sacraments? Baptism, Confirmation, Holy Eucharist, Penance, Extreme Unction, Holy Orders, and Matrimony. Baptism is the sacrament which cleanses us from Original Sin, makes us Christians, children of God, and heirs of Heaven. 13. What is the Holy Eucharist? The Holy Eucharist is the sacrament which contains the Body and Blood, Soul and Divinity of our Lord Jesus Christ, under the appearances of bread and wine. Penance is the sacrament by which sins committed after Baptism are forgiven through the absolution of the priest. 15. What is Extreme Unction? Extreme Unction is the sacrament which, through the anointing and prayer of the priest, gives health and strength to the soul, and sometimes to the body, when we are in danger of death from sickness, accident or old age. 16. What is Holy Orders? Holy Orders is the sacrament by which bishops, priests and other ministers of the Church are ordained and receive the power and grace to perform their sacred duties. 18. What are the principal effects of Confirmation? An increase of sanctifying grace received in Baptism. The strengthening of our faith. The seven gifts of the Holy Ghost. An indelible mark imprinted on our souls. 19. What are the seven gifts of the Holy Ghost? The seven gifts of the Holy Ghost are: Wisdom, Understanding, Counsel, Fortitude, Knowledge, Piety and Fear of the Lord. 20. Explain the purpose of the various gifts of the Holy Ghost. Wisdom gives us a relish for the things of God and directs our whole life and all our actions to His honor and glory. Understanding enables us to know more clearly the mysteries of the faith. Counsel warns us of the deceits of the devil and of the dangers to salvation. Fortitude strengthens us to do the will of God in all things. Knowledge enables us to know the will of God in all things. Piety makes us love God as a Father and obey Him because we love Him. Fear of the Lord fills us with a dread of sin. 21. Is there only one God? 22. How many Persons are there in God? In God there are three Divine Persons: the Father, the Son and the Holy Ghost. 23. Is the Father God? Yes, the Father is God and the First Person of the Blessed Trinity. 24. Is the Son God? Yes, the Son is God and the Second Person of the Blessed Trinity. 25. Is the Holy Ghost God? Yes, the Holy Ghost is God and the Third Person of the Blessed Trinity. 26. What do we mean by the Blessed Trinity? By the Blessed Trinity we mean one and the same God in three Divine Persons. 27. Are the Three Divine Persons really distinct from one another? Yes, the Three Divine Persons are really distinct from one another. 28. Are the Three Divine Persons perfectly equal to one another? Yes, the Three Divine Persons are perfectly equal to one another, because all are one and the same God. 29. How are the Three Divine Persons, though really distinct from one another, one and the same God? The Three Divine Persons, though really distinct from one another are one and the same God because all three have the same divine nature. 30. Can we fully understand how the Three Divine Persons, though really distinct from one another, are one and the same God? We cannot fully understand how the Three Divine Persons, though really distinct from one another, are one and the same God, because this is a supernatural mystery. 31. What is a supernatural mystery? 32. Did God abandon man after Adam fell into sin? No, God did not abandon man after Adam fell into sin, but promised to send into the world a Savior to free man from his sins and to reopen the gates of Heaven. 33. Who is the Savior of all men? The Savior of all men is Jesus Christ. 34. What is the chief teaching of the Catholic Church about Jesus Christ? 35. Why is Jesus Christ God? Jesus Christ is God because He is the only Son of God, having the same divine nature as His Father. 36. Why is Jesus Christ man? Jesus Christ is man because He is the Son of the Blessed Virgin Mary and has a body and soul like ours. 37. Is Jesus Christ more than one person? 38. How many natures has Jesus Christ? Jesus Christ has two natures; the nature of God and the nature of man. 39. Was the Son of God always man? No, the Son of God was not always man, but became man at the time of the Incarnation. 40. What is meant by the Incarnation? 41. How was the Son of God made man? 42. When was the Son of God conceived and made man? 43. Is Saint Joseph the father of Jesus Christ? Jesus Christ has no human father, but Saint Joseph was the spouse of the Blessed Virgin Mary and the guardian, or foster father, of Jesus Christ. 44. When was Jesus Christ born? Jesus Christ was born of the Blessed Virgin Mary on Christmas Day in Bethlehem more than two thousand years ago. 45. What is meant by the Redemption? By the Redemption is meant that Jesus Christ, as the Redeemer of the whole human race, offered His sufferings and death to God as a fitting sacrifice in satisfaction for the sins of men and regained for them the right to be children of God and heirs of Heaven. 47. Why is this sacrament called Confirmation? the grace of Jesus Christ bestowed in Baptism. 48. What is Holy Chrism? Holy Chrism is composed of olive oil and balsam blessed by the bishop on Holy Thursday. What does the olive oil signify? The olive oil signifies the inward strength conferred upon the soul by the Holy Ghost. 49. Who has the power to confirm? The power to confirm resides in the bishops of the Catholic Church who, succeeding the Apostles, are the ordinary ministers of Confirmation. 50. Who can be confirmed? Anyone who has been baptized but not yet confirmed can receive this sacrament. 51. What are the conditions required for receiving Confirmation? The person must be a baptized Catholic. He should be in the state of grace; that is, free from all mortal sin. He should take a saint’s name, one different from his baptismal name. He should be well instructed in the principal doctrines of the Catholic Faith. 52. Why is the forehead anointed with the sign of the Cross? To teach us that sacramental grace is given in virtue of the sacrifice of the Cross only. To remind those confirmed that they must be ready to profess boldly their faith in Christ Jesus crucified. That by this sacred unction the soul is sealed in the Holy Ghost with a spiritual, indelible mark, which enrolls those confirmed forever in the service of Christ. 53. What does the bishop say in anointing the person he confirms? 54. What does the blow on the cheek signify? The blow on the cheek signifies that by Confirmation the confirmand was strengthened to suffer; and if necessary, even to die for Jesus Christ. 55. What is a sacrament? A sacrament is an outward sign instituted by Jesus Christ to give grace. 56. What is the outward sign of Confirmation? The outward sign of Confirmation is the visible action by which the sacrament is administered, and consists of matter and form, which signify the grace to be conferred. 57. What are the matter and form of Confirmation? The matter of Confirmation consists in the laying on of the bishop’s hands, and the anointing with Holy Chrism. The form of Confirmation consists in the sacred words pronounced by the bishop, which express the receiving of the Holy Ghost and the sealing of the soul in Jesus Christ. 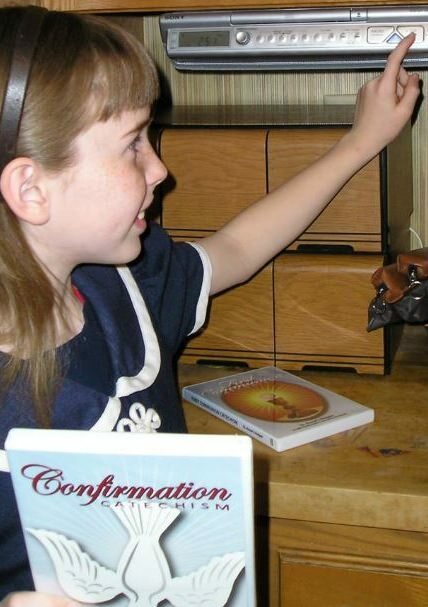 Did Jesus Christ institute the sacrament of Confirmation? 58. Is Confirmation necessary for salvation? No, Confirmation is not, like Baptism, absolutely necessary for salvation; but all Catholics ought to receive it if they have the opportunity, as it confers additional sacramental grace. 59. Is it a sin to neglect Confirmation? 60. May clerics or members of religious orders act as sponsors? No, this is forbidden without special permission. This is an extra special part of this Catholic Confirmation catechism. Many booklets do not cover these questions and answers. We need to know the enemy and the weapons we are to use so we can keep the Faith. 61. Do the sacraments always give grace? Yes, the sacraments always give grace if we receive them properly. 62. When did the Holy Ghost come down upon the Apostles? The Holy Ghost came down upon the Apostles on Pentecost Sunday, or Whitsunday, ten days after Our Lord’s Ascension and fifty days after Easter. 63. Who else was with the Apostles? The Blessed Virgin Mary was with the Apostles when the Holy Ghost came down upon them. 64. How did the Holy Ghost come down upon the Apostles and the Blessed Virgin Mary? The Holy Ghost came down upon the Apostles and the Blessed Virgin Mary in the form of tongues of fire. 65. What are the symbols of the Holy Ghost? The symbols of the Holy Ghost are: dove, oil, cloud, water, fire. 66. What were the Apostles like before the Holy Ghost came down upon them? Before the Holy Ghost came down upon the Apostles they were afraid and slow to understand the teachings of Our Lord. 67. How long will the Holy Ghost remain with the Catholic Church? 68. What do we mean by a soldier of Jesus Christ? By a soldier of Jesus Christ we mean a person who is willing to defend Jesus Christ, His teachings, and His Church. 69. Who are the enemies a soldier of Jesus Christ must fight against? The enemies a soldier of Jesus Christ must fight against are namely these three: the world, the devil, and the flesh. 70. What do you mean by ‘the world’? By ‘the world’ I mean people or things in the world that try to make me do wrong and lead me away from God. 71. What do you mean by ‘the flesh’? By ‘the flesh’ I mean temptations that come from within myself that urge me to please myself instead of trying to please God. 72. What do you mean by ‘the devil’? By ‘the devil’ I mean that bad angel who sinned against God and who tries to make me do the same. 73. Which weapons has Jesus Christ given us to use? The seven gifts and twelve fruits of the Holy Ghost. 74. What kind of person must I choose to be my sponsor? A baptized practicing Catholic who is confirmed. The same gender as myself. At least 14 years or older. Not the sponsor I had in Baptism. 75. Will the gifts of the Holy Ghost always remain with me? Yes, the gifts of the Holy Ghost will always remain with me as long as I do not commit any mortal sin. Come Holy Ghost, fill the hearts of Thy faithful and enkindle in them the fire of Thy love. O God, Who didst instruct the hearts of the faithful by the light of the Holy Ghost, grant us by the same Spirit to be truly wise, and ever to rejoice in His consolation. Through Christ Our Lord. Amen. 2. Do These Catholic Confirmation Catechism Questions Match Yours? 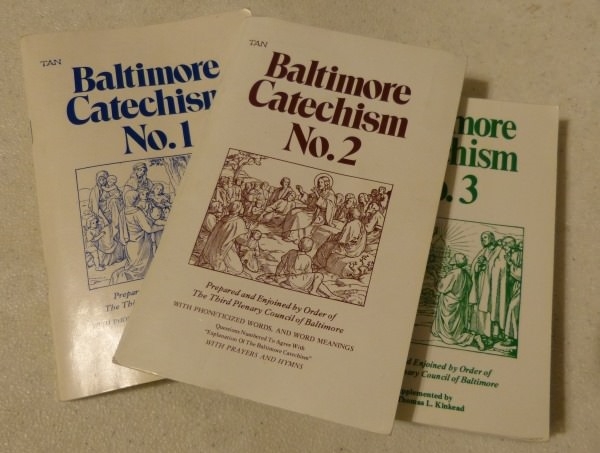 The Baltimore Catechism marked certain questions that were to be memorized before receiving Confirmation in the Catholic Church. The verbatim text of St. Anne's Helper Catholic Confirmation catechism audios and copybooks is printed on this page and you can also print it here, too. If the questions that you or your students need to learn match these questions and answers, you can use the Audio and Copybook downloads to help prepare for the Confirmation test. The audio CD and the audio Download each have the printable text file as well as the audio file, the same text you see on this page. The numbers below correspond to the numbers on the audio and the copybooks for easy reference. When the text is printed from the CD or the Download there are 76 prayers and answers on twelve pages of text. The Confirmation catechism copybooks are available as either manuscript or cursive writing which makes these easy to use for handwriting practice, too. 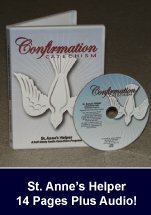 This Audio Catholic Confirmation Catechism asks the Baltimore Catechism No. 2 questions. Includes text PDF for help memorizing the answers. Like having a tutor!